Senior Clock is a 24 hour clock/calendar. It works on an electric plug and uses an "AA" battery for limited backup if the electricity is interrupted by power failure or moving the clock to another location. The lit device is table mounted and displays in clear readable capital letters and numbers -- the full day name, date and month. This appears in blue non-digital lights. 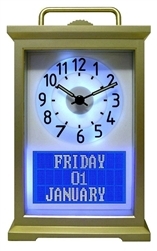 The Senior Clock is unique as it is neither digital or flip words. The day, date and month consist of the same tiny little bulbs that are seen in a TV screen. When introduced to a patient in the early stages, they can be easily trained to rely on the clock rather than the caregiver. This is a big relief! It can even be programmed for twelve different languages!! Dutch, English, German, French, Spanish, Swedish, Norwegian, Danish, Finnish, Portuguese, Turkish & Italian. This is a device meant for the senior eye and the earlier they can become adjusted to recognizing the face, the longer they will retain this ability. This is meant for the eye that is losing cognitive ability similar to our other clocks in that these lights are not digital. Average Rating: 4 of 5 Total Reviews: 5 > Write a review and receive 10% off! The clock was very nice for my grandmother. Thanks for it! The clock is a good size, easy to setup. Clock design very nice. The size of the month & day names & date is a good readable size. I bought a clock which was not as described. The company worked with me to make me a satisfied customer. Really 4.5 stars! We looked at many day and date clocks before ordering this one, even printed out "life size" images. 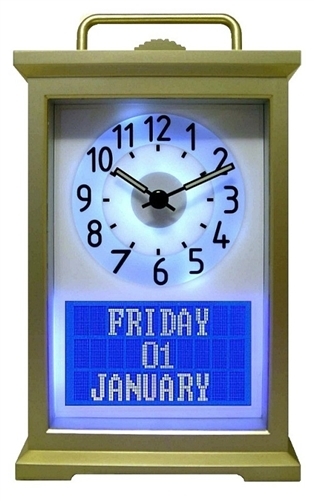 We liked its general attractiveness (especially to the woman receiving it), the analog clock (right for today's elderly), the un-abbreviated day and date. She has short term memory issues and some dementia, without Alzheimer's. This would have 5 stars if initial zeros could be eliminated (e.g., "5" instead of "05") and if there were a choice in the order of day and month ("May 5" as well as "05 May"). These are very minor complaints/refinements that have not been a problem for our family member. We hear frequently how much she appreciates this clock. Material fair but style of clock very nice. Easy to read, adjustable lighting a nice feature. The perfect combination of time, day & date in one place!